Surprise! No plain-vanilla greeting cards here. Crafters, take note: with the addition of a fun paper pop-up, it’s easy to propel your handmade cards into the third dimension. Is a special birthday coming up? How about Mother’s Day, Valentine’s Day, or even Halloween? Any occasion can be made more festive with a handcrafted pop-up card. Just follow Aunt Annie’s simple instructions, and your cards will be the most pop-ular on the block! 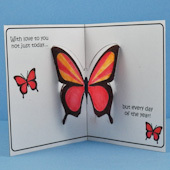 Crack open a variety of pop-up card-making projects on this page, from butterflies and balloons to hearts and birthday candles. Pick a pop-up and get your scissors ready! Related crafts: For more adult card crafting, see the Greeting Card Class tutorials. Aunt Annie also has card crafts for children, see Greeting Cards Kids Can Make. 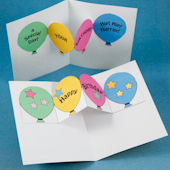 Step Pop-Up Cards - Make a pop-up greeting card for a variety of occasions. See how easy it is to make a step pop-up mechanism, also sometimes called a platform or double-slit pop-up. Once you learn this technique, it's a simple matter to create pop-up cards of your own design. More Step Pop-Up Cards - Everyone enjoys receiving a card with a pop-up inside. It's easier than you might think to add a pop-up to one of your handmade greeting cards. To get you started, three cards with step pop-ups are included in this project. New Year Pop-Up Cards and Invitations - How about a New Year greeting that's special and different? Make these New Year greeting cards with a pop-up inside. The pop-up is a chain of balloons with a Happy New Year message. The card can be made in three styles with one being fun, another being brassy, and the last is a New Year invitation. Thanksgiving Pop-Up Cards - Use printable patterns to make a greeting card for Thanksgiving with a turkey pop-up inside. The project includes black & white and colored patterns for two Thanksgiving card designs. There is also a printable pattern for separate turkey pop-ups that can be added to your handmade or commercial cards. Birthday and Party Pop-Up Cards - What is it about balloons that makes them so much fun? You can’t put a real balloon in a card, but you can capture their cheer with this simple balloon pop-up. A chain of balloons floats up from these colorful cards, perfect for birthdays, parties, and other celebrations. 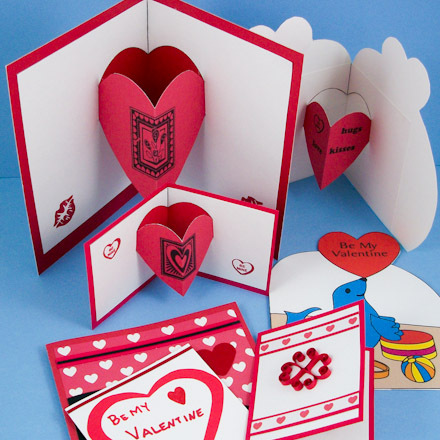 Valentine Heart Chain Pop-Up Card - Valentine’s Day is a universal “card” holiday. Millions of Valentines are sent each year in the U.S. alone, with millions more e-cards sent worldwide! But don’t worry—featuring a chain of paper hearts (similar to a paper doll chain), your handmade pop-up card will stand out from the crowd. Halloween Pop-Up Cards - A night of frightful fun is at your fingertips with easy-to-make Halloween pop-up cards! Craft a paper jack-o-lantern that jumps out for spooky special effect when the recipient (or victim) opens their card. Pop-up Birthday Cards - Celebrate birthdays with a customized handmade pop-up card featuring the birthday child’s age! It’s a candle that never goes out. 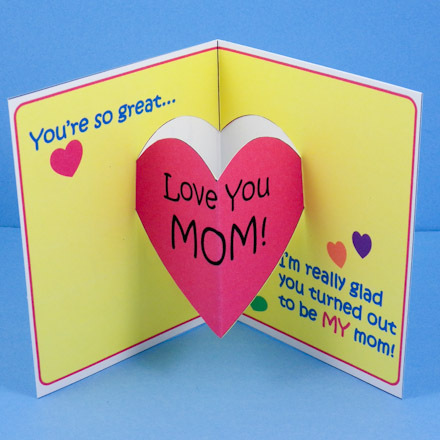 As a bonus, this simple V-fold pop-up technique can be applied to any other greeting card. Mother's Day Pop-Up Card - Mom won’t be expecting the sweet surprise that springs out from this handmade Mother’s Day pop-up card! 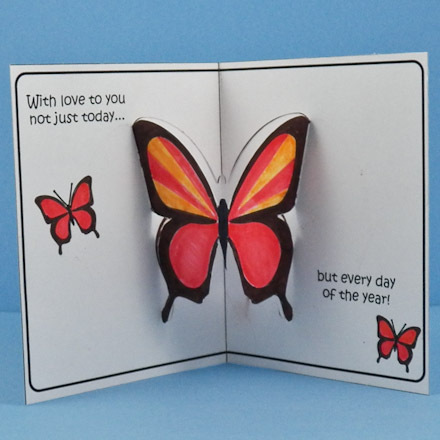 A heart-shaped cutout is the perfect backdrop for a heartfelt message; or, let your words take flight with a vibrant butterfly pop-up card. Valentine Heart Pop-Up Cards - Make a simple Valentine’s Day pop-up card for your sweetheart! Or, apply the same technique to greeting cards for special occasions on the 364 days of the year that aren’t February 14. Kids are delighted by pop-up "technology," while older crafters can customize cards to their hearts’ content. Tip: Add the separate heart pop-ups from the Pop-Up Card craft project to pocket cards, quilled cards and Heart-Shaped Cards.